Tipping Point is a Point’n’Click adventure series created by Dan Russell-Pinson, and the good news is that the chapter three is now live! 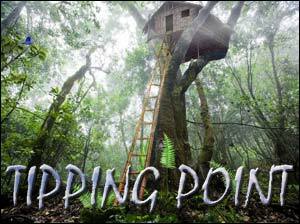 “After several months of work, I am happy to announce that chapter 3 of Tipping Point is completed and ready to play. Once the title screen loads, click “Play Game” to start from the beginning or click “Load Chapter” and enter “FREEKL” to start playing chapter 3 immediately” said the author. If you like the Tipping Point series, please support Dan and consider making a donation to help keep the game going! I am having a hard time getting the lion’s mouth open. (I did it once before but had to turn off the game and I don’t know how to save.) The colors on my cassette are blue and pink, when I entered them in the lion’s eyes he won’t open his mouth. Help! The dots R not blue and pink! They R blue and red. Do u no wat buttons 2 press on the Merman 2 get the pad off? I have tried 2 get it off but it is so hard. I am having trouble finding the key pad for the ‘instrument’ can somebody help me?? I already have the other components! Karen just switch the device on.You will find the on switch near the top right corner that will start the game.Once your finshed it will give you the pad.Hope this helps. Thoroughly enjoyed this game until the beetle. I am not coordinated enough to ever, ever catch that thing. This is why I will never be a big gamer. Games are supposed to be fun, not this darn hard!!! how to open lion mouth. help!!! how do you change the lions eyes? help! i can’t beat the merman, it’s hard. for people having trouble with lion the black cassette notice it has a blue dot on the left side and a red dot on the right side play the black cassette then go down to lion notice its be awakened change the colors of the eyes like on the cassette blue on left red on right then click the mouth then type in the #s (159). hope this helped and also i need help with the merman i played it wrong and i dont know how to start again! how do you play the merman? and how do i find all the pieces to the device? Ok I have no idea how to play merman, but I will answer a few questions. A: as long as you are playing the tape, and the lions eyes are lighting up, just click on the eyes to change their color. plz tell how to open the merman other says that press the buttoms and the button will show light but they dont plz help me out i m stuck! i need help getting the fruit how do i get it? It keeps telling me to go to investigate transport room grr what do I do in their to move on w game?????? Posted on Tuesday, March 25th, 2008. Follow any responses through the RSS 2.0 feed.